For art history you can trust, there is no better location in Britain right now than the Queen’s Gallery, in Buckingham Palace. While the National ­Gallery — which can be trusted most of the time — puts on a pair of purple hot pants for its new ­photography show, Seduced by Art, and tries to appear ever so with-it, the Queen’s Gallery gives us an event that examines exactly what it says on the tin. The Northern Renaissance is about the Northern Renaissance. Hallelujah. Mind you, plenty of modern scholars would give you a lengthy argument about the meaning and trustworthiness of the term “Northern Renaissance”. Many would insist that no such thing ever existed. Their view is that you cannot lump together the art produced in Germany, the Netherlands and France in the 15th and 16th centuries, and claim a single identity for it. Dürer, Cranach, Holbein, Bruegel and the rest must be viewed as individual practitioners, say the naysayers, whose distinction from the other Renaissance, the Italian or Southern Renaissance, has been overstated. Reader, if you encounter one of these ­naysayers anywhere near ­Buckingham Palace, grab them by the ear, yank them to the Queen’s Gallery and instruct them to open their eyes. Anyone who cannot spot the presence here of a distinct aesthetic needs to sit their GCSE in art all over again. The introductory gallery ­welcomes us with a bulky ­portrayal of Martin Luther, by Lucas Cranach, and Dürer’s marvellous depiction of the gnarled Erasmus in his study. Thus, the point is immediately made that the Northern Renaissance had a religious and ­philosophical underpinning. Of course it did. 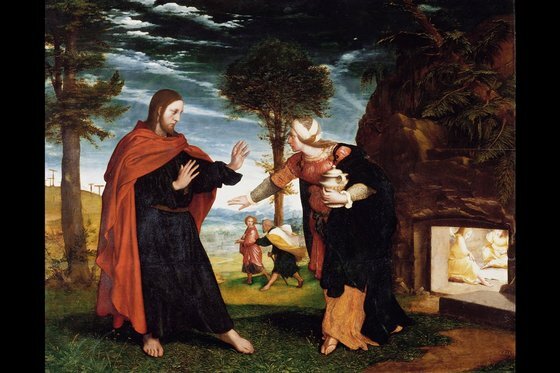 It’s certainly ­simplistic to claim that the Northern Renaissance was Pro­testant in tone, while the Southern Renaissance was Catholic, but that doesn’t make it entirely untrue. The really interesting question is: what came first, the tone or the religion? Dürer, the first artist to be examined in depth here, was born a Catholic, yet his art has a Protestant mood. The stunningly tangible portrait of a chap known as Burkhard of Speyer, which was acquired by Charles I and used to hang among his most precious pictures in the Chair Room, at Whitehall Palace, was actually painted in Venice, in 1506. Yet everything about it is un-Italian. Not an ounce of flattery is attempted anywhere. Burk­hard’s piggy little eyes have had no painterly surgery done on them to make them bigger or soppier or more oval or in any way enticing, in that Leonardo manner. With his big nose, sallow complexion, high cheekbones, dry blond hair and pointy chin, he is magnificently unimpressive. This is more than a different aesthetic. This is a difference in genetics. Which is not to say that Dürer could not dream floridly, or imagine things. On the wall opposite Burkhard is a selection of fiery woodcuts from Dürer’s illustration of the Bible’s scariest predictions, the ones described by St John in the Book of Reve­lation, otherwise known as the Apocalypse. The text is full of terrifying visions that ought to be unillustratable. Yet here is Dürer imagining some of the best monsters in art. The seven-headed thing with the horns of a goat and the body of a plucked dodo that emerges from beneath the skirts of the Whore of ­Babylon deserves some sort of Oscar for horribleness. All this is wild-eyed fantasy, yet it is the tangibility of the textures that impresses. Whether he is describing the scales on a seven-headed dragon, or the soft cascading hair of the Virgin Mary, or the coarse cotton cloak worn by Erasmus, Dürer ­manages to persuade black-and-white engraving to conjure up instantly recognisable full-­colour textures. That’s his genius. Apart from Melancholia, all his best prints are here, in particularly clear impressions. Because the Royal Collection is essentially a bottomless pit of great art treasures from across the ages, the display can detour at will to some superior examples of Northern Renaissance output from other artistic fields. Dürer was the son of a goldsmith from Nuremberg, and to prove that the Nuremberg goldsmiths were the finest in Europe, a couple of their most ornate cups have been carefully positioned in front of that gruesome Apocalypse, where they provide some gorgeous golden distraction from the dark ­psychological horror. Later in the show, when we get to Holbein, the Royal Armoury is also lightly raided, and the ornate breastplates and helmets worn by Henry VIII are on display. They are absolutely gorgeous, delicately and skilfully worked with scenes from Ovid. How paradoxical to see the accoutrements of war covered in so much elegant learning. There are book ­illustrations, too. And, right at the end of the show, a pair of huge Netherlandish tapestries depicting the fall of man. This, therefore, sets out to be a rounded picture of the Northern Renaissance across all the arts. So it says something mysterious about the power of painting that it is the insistent realism of Dürer, Cranach, Holbein that dominates the atmospheres and sets the tone for the whole ­journey. Given the German origins of the royal family, it makes lots of sense that their ancestors were keen collectors of art from these regions. The Royal Collection has good examples from most of the main territories of the Northern Renaissance. Dürer supplies the first focus, ­Holbein the second. An extravagant selection of the best Holbeins in the collection, many of which have been cleaned specially for this event, has been arranged in the loveliest of the galleries here. All the things he was best at — miniatures, drawings, religious pictures and, of course, portraits — are represented. It’s a show within a show, and almost scarily impressive. Great indeed was the day when Henry VIII made Holbein his court artist. Totally convincing faces. Totally convincing textures. Real psychological presences. No half-timbered stiffness. No stubborn medievalism. It’s as if the entire Tudor age has been put on pause, while another age, playing at another speed, has started up in the same time span. What a contrast. What a mismatch. His portraiture is particularly well represented. And the recent cleanings have thrown up some real surprises in his colour schemes. Who would have thought that Hans of Antwerp is actually standing in front of a cool grey wall, not the nicotine yellow fog we are used to? The Royal Collection also owns the finest collection of Holbein drawings, and is able here to show one next to the other in a couple of exciting face-offs that allow you to see the changes made in the progression from drawing to painting. It’s gripping stuff. Holbein arriving in England was like Frankel trotting into a paddock of shire horses. Horrible Hal may have been a monstrous royal presence in most of what he did, but in hiring Holbein, he did more than any other British monarch ever has to progress the story of British art.